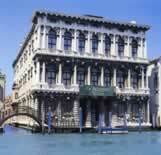 City Tours in Venice: guided walking tours to explore the City of Venice. “... thrusting itself upon the water with a peculiar florid assurance, a certain upward toss of its cornice which gives it the air of a rearing sea-horse ”. Ca' Rezzonico is one of the richest and most magnificent palaces on the Grand Canal, testimony of the folie de grandeur of the noble Venetian families of the past. The museum is arranged in such a way so as to offer the opportunity to experience the authentic atmosphere of a great 1700 private residence. The Rezzonico were bankers of Lombard origin who bought their way into the Venetian aristocracy in 1648 for the very considerable sum of 100,000 ducats (about 2 per cent of the entire annual revenue of the Republic!). They soon became one of most influential families in 18th C Venice, and could count among their members many officers in the highest Venetian political rank, and even a Pope: Clement XIII. The palace contains the richest collection of original 18th C Venetian furniture, ceramics and tapestries, brought together from a number of different Venetian palaces, and several incredible original frescoed ceilings, including 2 voluptuous composition by Giambattista Tiepolo intended to glorify the Rezzonico, and to proclaim their merit. A large number of Settecento paintings has been gathered on the 2nd floor: here are the only two Venetian views of Canaletto to be seen in the public collections of the city. This is also the house that Robert Browning considered as “a corner of my old age”. Here the poet died in 1889 while visiting his son Pen, who owned the palace for some years.